Good morning! Its Friday, which means its time for another release for the Seven Skeins club (any knitters not in the club and otherwise interested in these patterns will be able to access them from January). 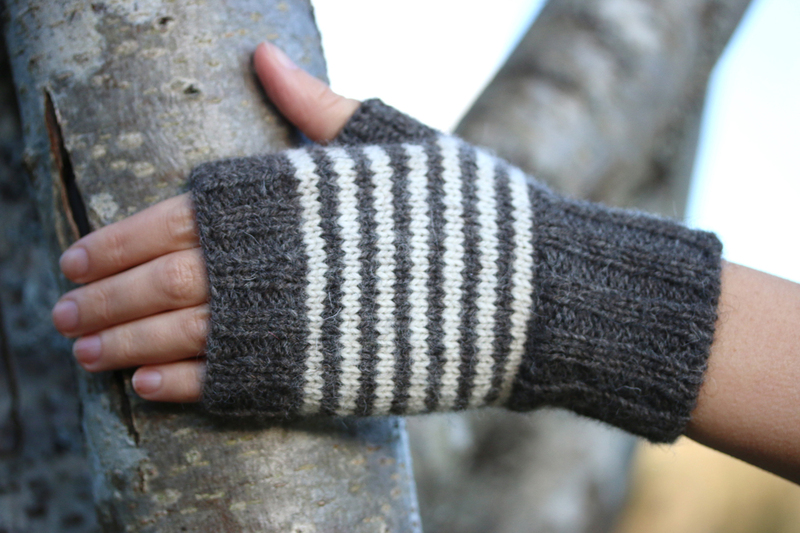 This week there’s another pair of stranded or striped patterns with which you can make yourself your choice of Pawkies. Pawkies is one of those brilliantly descriptive Scots words which primarily means mitts or mittens. The word is thought to be a diminutive form of either paw, or poke – or perhaps both, since ones thumb and fingers poke out of them, and they are something to pop on your paws. Pawkie is a word with a variety of other resonances in Scots too, my undoubted favourite of which is the fabulous seventeenth-century phrase jiggery-pawkerie, which is the the origin of the probably more familiar English term jiggery-pokery, meaning trickery. I suppose one might get up to all sorts of jiggery-pawkerie in these pawkies, since they leave one’s fingers free and unrestrained. . . The basic pawkie design is pretty straightforward – a shaped tube with ribbing at either end and an afterthought thumb. I’ve added instructions for a tubular cast-on which gives a really nice, stable edge at the wrist and which I found particularly pleasing to work. If you’ve never attempted a tubular cast-on, please do give it a try (the finish is so lovely) – but if you aren’t keen on the faff you can always stick to your usual cast-on with no problem. As previously, I’ve written two variants of the pattern to suit your preference. 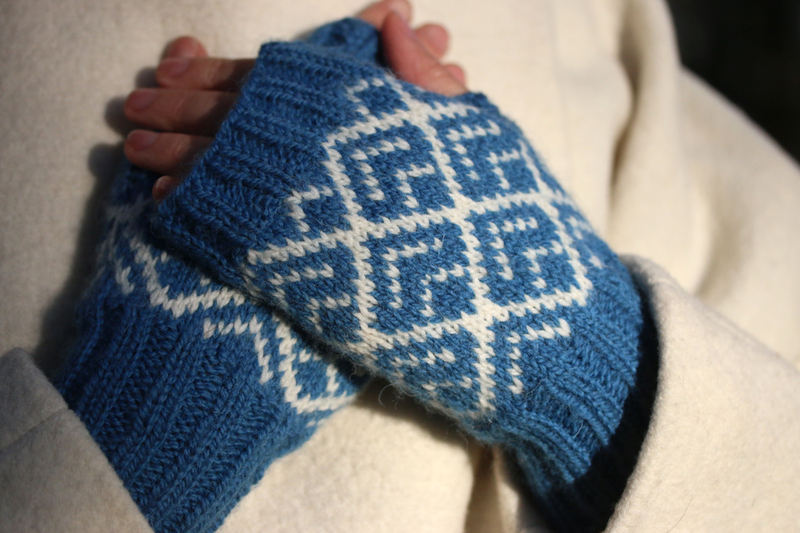 The stranded pawkies feature a slightly modifified version of the mountain-motif that I used on the Baffies, and I found the chart worked up particularly nicely in Between Weathers and Ptarmigan (blue and white is one of my favourite winter combinations). One interesting aspect of knitting a few samples of the same essential design is observing the subtle differences in behaviour between striped and stranded knitted fabric. 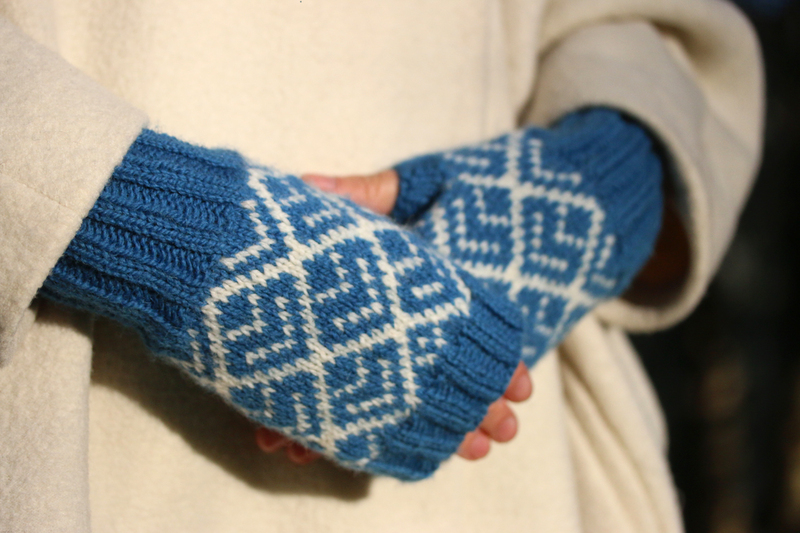 Looking at the two patterns, you may note that the striped and stranded versions have different stitch counts: this is because we found that the inner circumference of a pawkie was significantly reduced when knitted in stranded colourwork. There’s a real nip in the air today, and it is definitely pawkie weather. Have a lovely weekend, and I hope you enjoy lots of jiggery-pawkerie in your pawkies! 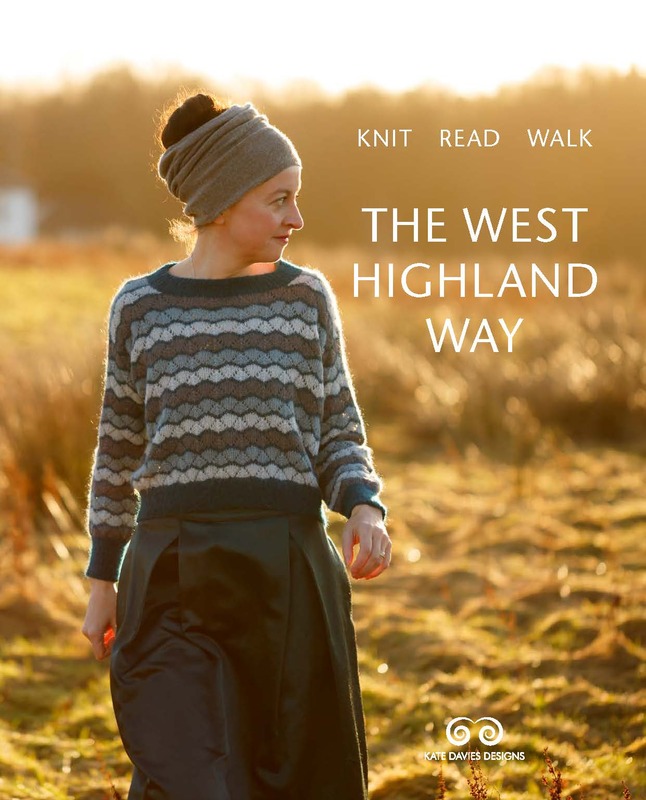 Just found this lovely blog and looking forward to knitting some of the patterns. How does one become a member of the Seven Skeins club? Thank you Kate…wil wait patiently! How wonderful to know that someone else calls them pawkies ……. I knitted my first pair when I was about nine! Just love getting these patterns and enjoy seeing everyone’s work. Later today I hope to be casting on the mittens from week 2. Thanks for the wonderful patterns and I really appreciate the classic looks as they are all be timeless knits! All your Beauties in this entire club are Fabulous !I have money saved for the next one,and I will never miss another.You have such amazing talent! Having fun ladies.I can only follow along for now,but in January I can make some beauties ! I hope I can find fiber close to Seven Skeins club. How very lovely each and every comment here is. I wish there was a like button for the comments – I would like each and every one. What lovely people KD disciples are. I live on the South Coast of England and peoplehere look at me very oddly when I use the words baffies, pawkies, faff, oxter and so many more wonderful descriptive words – ‘proper’ English words are pale in comparison… in my opinion. Pawkies, perfect weather for them and Genevieve has the right of it!! Thank you. More lovely patterns. Thank you. 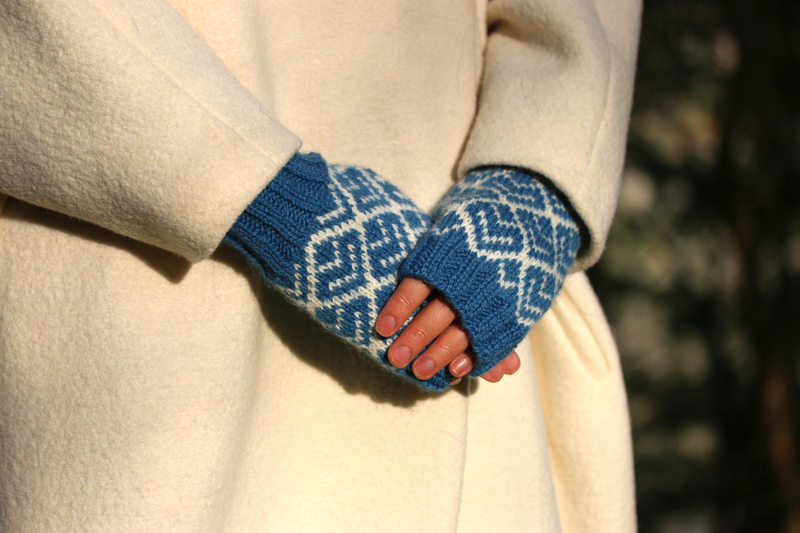 I have to agree with SueMcD though, and put in my tuppence-worth – That my understanding of the word “pawkies” is that they are fully enclosed mittens covering thumbs and ends of fingers, just like your Kokkeluri pattern. Nothing to do with poking outwards, but related perhaps to poca and pocaid, both Gaelic words for pocket. Hence the word “poke” in Scots that literally means bag. e.g. poke a sweeties or poke a chips. 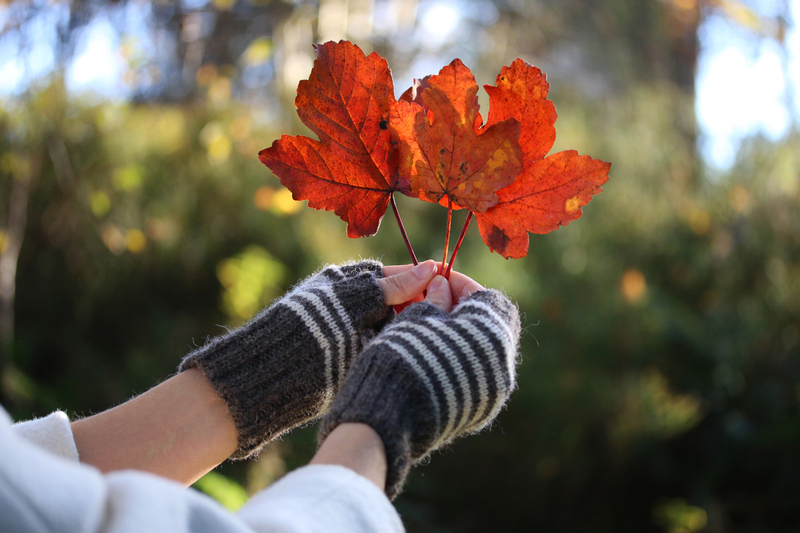 So little knitted bags for the hands are Pawkies……. this makes perfect sense, Lorraine, thank you – I had not considered the Gaelic associations. 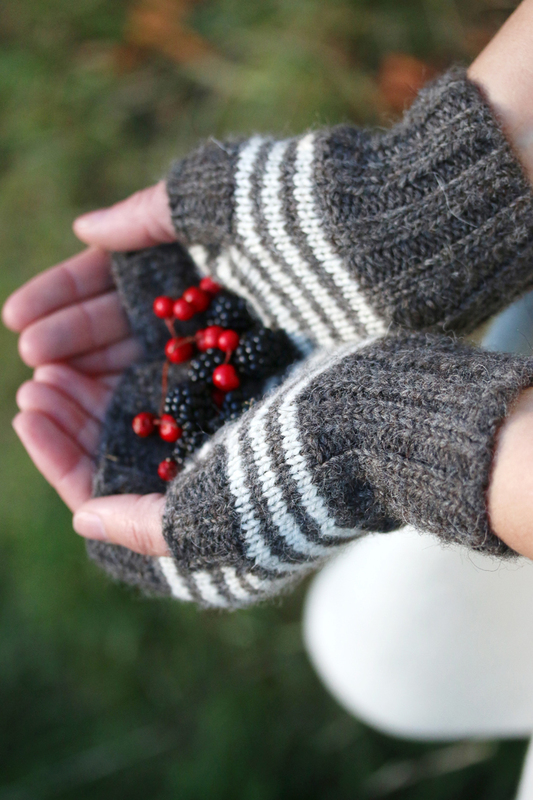 In the some areas of the North of England, fingerless mitts are known as “pokies” . . . but perhaps this is, as you say, a derivation of poke as in pocket? You give new meaning to TGIF (thank God it’s Friday). 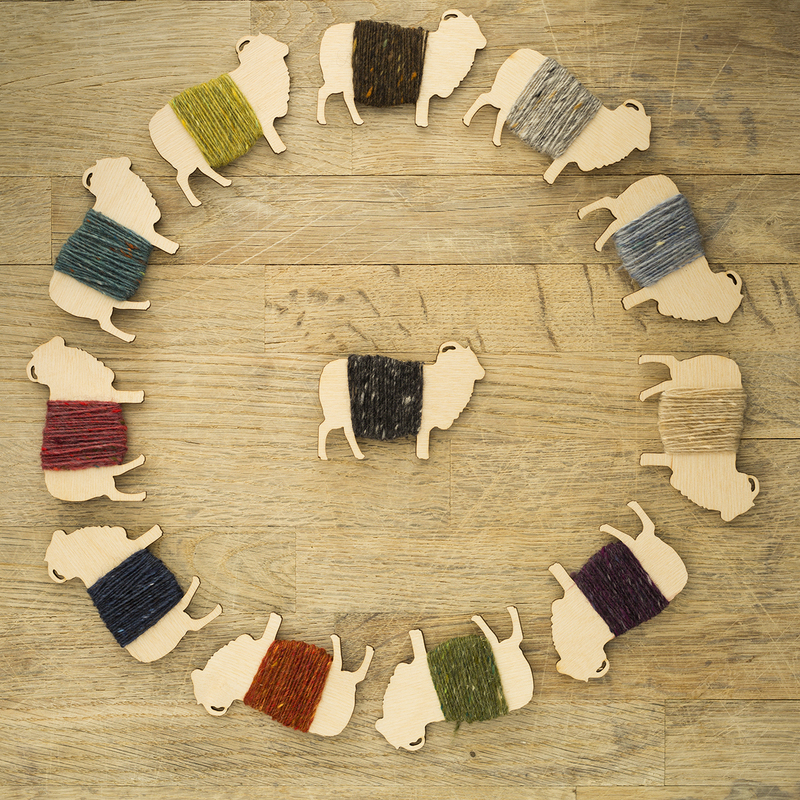 I use to look forward to Friday because it meant the weekend, however I now look forward to Friday for a new pattern from Kate waiting in my email box…Yipee! I am having such fun being in the Seven Skeins Club. Love the surprise of new patterns each week, love deciding which ones to knit, and love trying new techniques with thisd lovely yarn. So glad I joined! 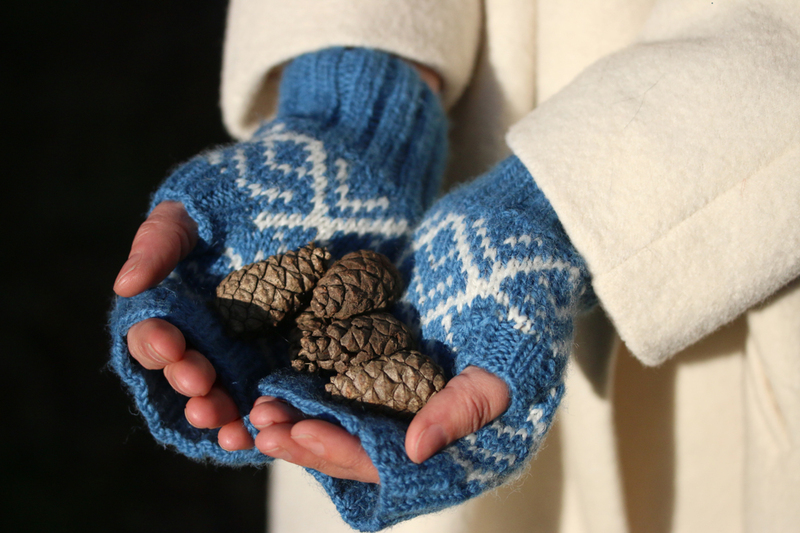 Oh how I am looking forward to these patterns being released in January……..
Well, what a coincidence as I was just thinking recently that no one uses the word pawkies these days. When we were children my mother knitted us pawkies but they had thumbs and fully covered our hands so I suppose they were really mittens. I had never heard them called mittens back then. We only ever called them pawkies. Your patterns are lovely and good to see this old word being used again. 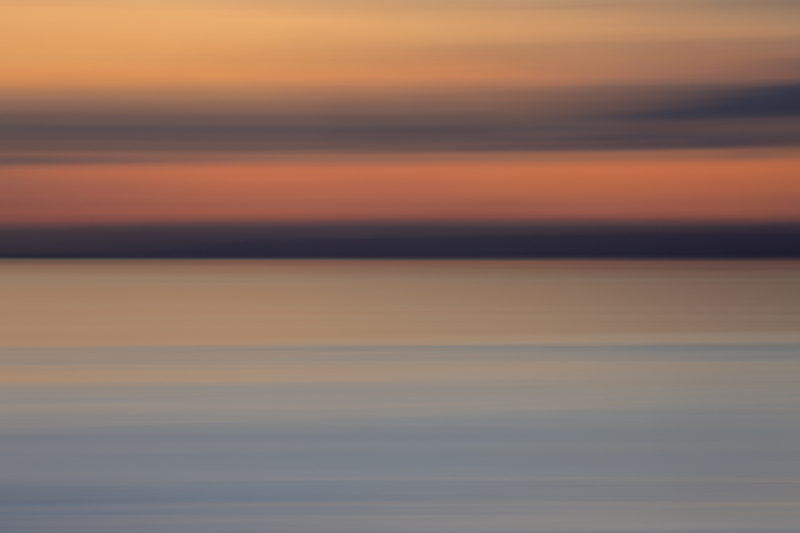 Lovely patterns. I’m looking forward for the opening in January because I’m no member of the club. All the patterns so far are beautiful. I too, was frightened of the two circular needle cast-on. I joined the club determined to stretch my knitting boundaries and to get my hands on the yarn and to knit some “Kate Davies”. I am now a convert. It is so easy. Give it a go “OneFrenchWord” it is tres facile! I’m still collecting all the patterns and humming and haa-ing about which to do, which colours to use. I’m a bit frightened of two circular needle cast-ons, apart from anything, never seem to have the right needles available,but maybe I will have a try. The edge does look incredibly neat and sturdy. Lovely designs, thank you, Kate. Good weekend to you three too.